A year ago today, I got up at dawn and began mashing bananas by the dozen. April 30 2013 was The Mango Bride’s publication date, a book launch was brewing and I needed to get cooking. Literally. I’d begun planning the book party nearly as soon as Penguin offered me a publishing deal two years earlier. After months of revising, proofreading, and attending to the many facets that go into of producing the final book, my baby’s birthday was nigh. The only problem was, I had precious little help beyond my immediate family. When a 130 people RSVP’ed to say they’d be coming, my first thought was What can I feed everyone? It’s not a real Filipino party without food. Since most of my savings were going toward a multi-city largely self-funded book tour, I’d have to cater this first event. 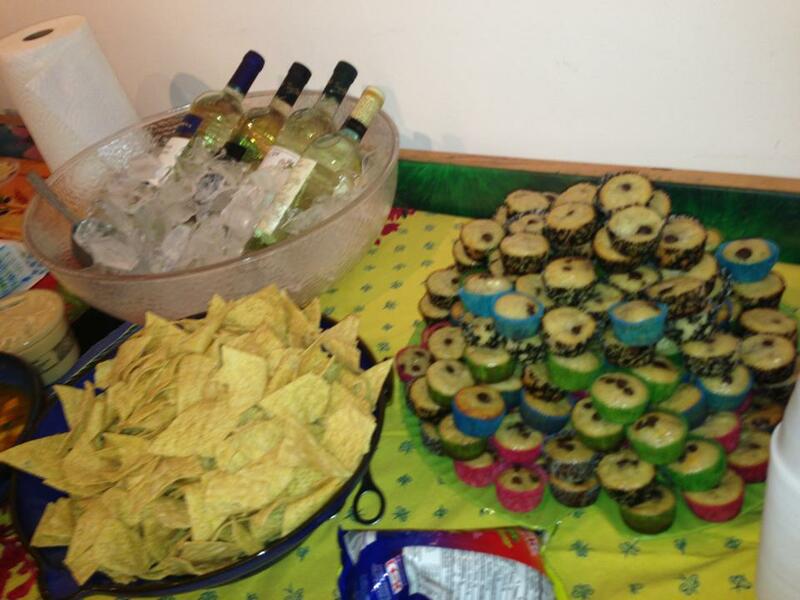 The most frugal option seemed to be the small plate strategy: bite-size cupcakes, little cubes of pork to skewer with toothpicks (no rice), a vat of mango salsa, chips. It wasn’t fancy but at least no one would leave hungry. 6:30 -8 a.m.- Bake 150 banana cupcakes. 8 – 9 – Prep breakfast and child for school. 9-10 – Vanity break – get a manicure. 10 – 12 noon – Bake another 150 cupcakes. 12-1 p.m. – Sanity break – go to yoga. 1-3 – Stew 15 pounds of adobo; chop up fresh salsa; and jump in the shower. 4-6 – Plate food, mix sangria, do sound check at the Ink Spot. Fortunately the copious detailed emails and a pre-production meeting I’d called weeks earlier paid off and everyone knew their specific tasks. My husband did all the heavy lifting and sound checks, while Chau’s husband got busy mixing the sangria. As the first guests trickled in, Chau began crooning torch songs. 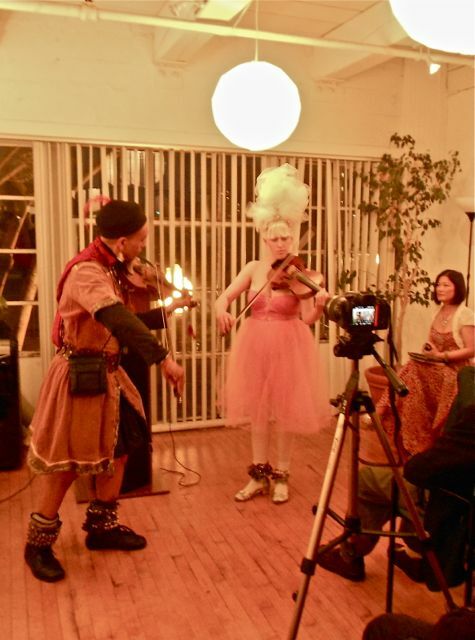 Thoth and Lila Angelique of Tribal Baroque arrived in time to tune their violins before the program began. By the time Judy began her introductory speech everyone had eaten and drunk enough to keep them happy till the reading was over. I’d practiced reading my excerpts daily for at least a month before – I knew when to breathe, when to flip open the fan when to pause for laughter. Luckily there was laughter. The reading passed in a blur but Tribal Baroque’s love song was truly memorable. I loved Tribal Baroque’s music so much I wrote them into The Mango Bride. Their own story has a happy ending – they are marrying this May. Sissie launched into the second set of songs as I began signing books. To Anne Mery’s delight, she sold all her copies. At the end of the evening, we bade goodbye to the guests, swept up what little remained of the food and folded the chairs. Begging indulgence from Sissie’s guitarist, my brother Chito made like Sinatra and sang Just the Way You Look Tonight for our last dance at the Ink Spot. A year since that first party I’ve attended book events in 17 cities, 8 states and 2 countries and have read to over a thousand people. Phew. On to the second year of touring.